This blog is called Inventory Full for a reason. My first proper post, seven years ago, was me talking about bags, banks and storage. I had some crazy idea back then that I was going to make inventory issues in MMOs my theme and purpose here. Well, that never happened. Even I couldn't write over 1200 posts about bags. (Or could I...? No, I couldn't). 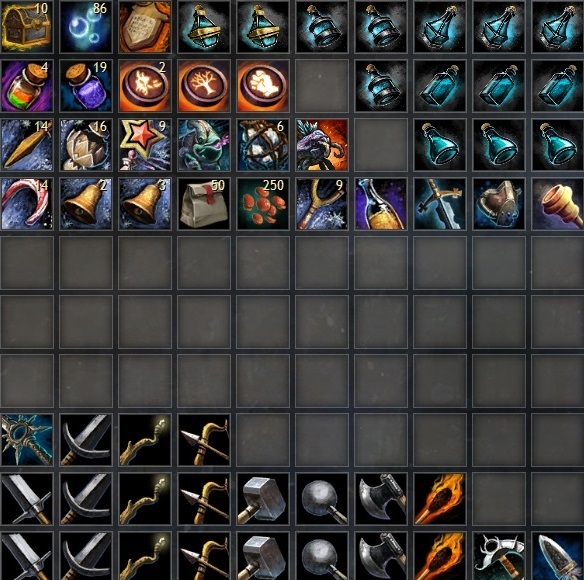 Nevertheless, inventory in MMORPGs remains a perennial subject of interest and concern, not least because it's both unavoidable and inevitable. Every MMO I've ever played uses some form of notional space in which imaginary objects are represented, most usually as icons, occasionally as lines of text. In some games there are very clear and defined limits to the number of things you and your characters are able to store. In others there seems to be literally no end to it. The art and science of storage in MMOs is often referred to as "Inventory Management", which makes it sound every bit as boring as many people believe it to be. Most MMO players would probably agree, if grudgingly, that there has to be some human involvement with the endless flow of goods and trinkets although there are those who argue the entire process should be both automated and invisible. Those extreme minimalists are unlikely ever to get their way. Inventory and storage perform much too important a function in almost all MMOs for the entire process to be eliminated. In many gameworlds, inventory space is a well-established upgrade path like gear and levels. Bags and boxes often mark the baseline for crafting and act as a staple in the crafted economy. Extra storage space and special, oversized or unique boxes feature frequently as sweeteners in Deluxe or Collectors Editions. Many free-to-play MMOs lean heavily on inventory space as a driver for cash shop sales and games with an optional subscription hold out enhanced storage options as a carrot to persuade people to subscribe. It's no use wishing inventory management away. It's not going anywhere. It's safe to say that although other options could undoubtedly be designed, the familiar practice of putting things in boxes is unlikely to go away any time soon. Or probably ever. That leaves the question of how to handle it with the tools we have. Inventory management is a skill but, unlike fishing or one-hand blunt it's not normally a skill you can increment by use or talent points (although I have a vague memory of playing some MMO where exactly that did happen). Perhaps it should happen more often. I rather like the idea of training up a skill and getting more inventory space, sort functions, tags and so on. As things stand, in almost all MMOs managing your inventory comes down to either a real-lfe flair for organization or having the kind of personality that doesn't balk at the thought of spending significant chunks of your leisure time doing imaginary housework. Some people are tidy, some people learn tidiness; most people just have a lot of stuff thrust upon them. Mrs Bhagpuss and I share a Guild Bank in GW2. This is her vault. Then there are people like me who not only enjoy managing their inventories but see it as core gameplay. It's not going too far to say that inventory management was one of the things that drew me into the MMO genre from the get-go. If I was to make a list of my top ten reasons for playing MMORPGs (hey, another Blaugust topic!) inventory management would make the top five. I find it involving, enjoyable, relaxing and satisfying but that doesn't mean I'm any good at it. Like most things in MMO gameplay I muddle along in my own inefficient fashion as best I can without ever making much of a dent in the activity I'm undertaking. My banks are a mess and my characters inventories are chaotic. I frequently create systems for storing stuff so I can get at it handily, spend hours getting those systems set up and running, then promptly forget to maintain them and let entropy do its awful work. I rarely know where anything is unless I use it every day. I make lists in notebooks and then lose them. I label boxes in game and then forget how to read the labels. In any MMO I play regularly I have so many characters and so many storage options I'd need a spreadsheet to keep track of it all - and the day I create a spreadsheet for a video game is the day I take my computer down to the nearest river and throw it in. Jeromai, Starshadow and Endalia all have something to say on the topic but Jeromai is hoping for some practical advice and I'm not sure I have much to offer. One tip I would give, which I'm absolutely sure will immediately be labeled as heresy by some, is never to take any option the game offers you to convert all your small bags into one big one. That's fine for organized people but if you're already having problems, removing the visual link between the individual bags in your inventory and the contents of those bags will make those problems worse. 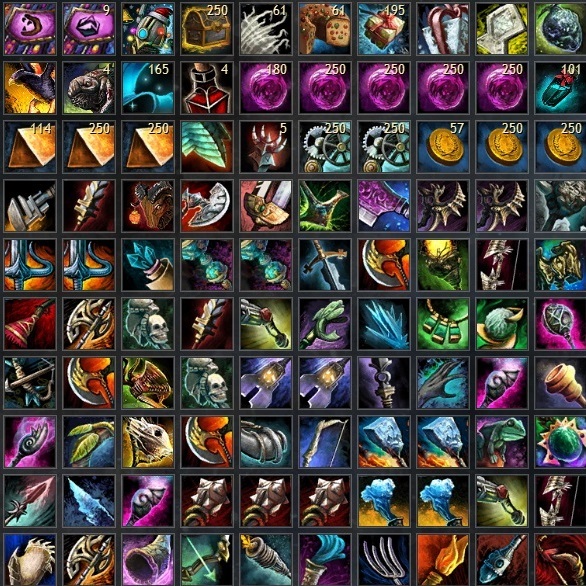 Many MMOs have different kinds of bags that auto-sort different things into them as you loot them. You can also sometimes re-name your bags with a descriptive title like "Bag for Twinking" or "My Dressing Up Box". Sometimes you can color-code bags or tell them apart by their icons. All of this helps and all of that help is lost if you munge the whole damn lot into one mega-bag. Anyway, as I say, I'n hardly the best person to be giving advice on this topic. It's like asking a compulsive hoarder to give you pointers on feng shuing your appartment. I'm opening the floor to anyone who thinks they can help Jeromai declutter because my personal solution is always buy more boxes! That said, I am going to think on this some more and post on it again. There's something to look forward to! I've been using OneNote to keep track of my MMO habits and characters - this came after deleting a character who actually had an important role in my organising... (so important, I can't actually remember the game or the reason). Since I have no real-life flair for organizing, I've recently taken the Marie Kondo approach of getting rid of everything I had no immediate use for. While this has emptied my bags quite a bit, I've gone too far at times, and ended up regretting my purge. Definitely a difficult balance!